If you’re looking for a beautiful plant that thrives with virtual neglect, a creeping sedum just might fit the bill. Sedum strut their stuff where many other plants dare not venture. They make themselves at home in the cracks of a garden wall or walkway, on roofs or the tops of gently sloping birdhouses, or even under massive trees where enormous roots monopolise most of the soil’s moisture. They make adaptable low groundcovers for the rock garden, green roof or vertical wall and perform well in borders, containers or between paving stones. 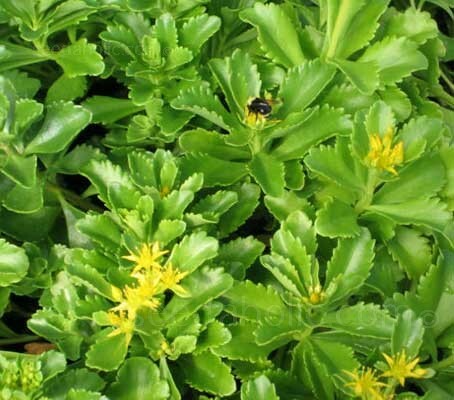 Growing to a height of 20cm (8in), Sedum selskianum is hardy to around minus 18°C (-28°F). It does best in porous soil and full sun to light shade and thrives in sun drenched rock gardens, crumbling walls or rocky scree. It also does well in containers in well-drained potting mix. Seeds can be sown in spring or late summer at temperatures around 10 to18°C (50 to 65°F). Cold temperatures (10°C / 50°F) will increase the cultivation time. In spring the plants start to grow at 15 to 18°C (60 to 65°F). Prepare a fine weed free free-draining bed. Mixing seed with fine sand will aid even distribution. Sow seed evenly over the surface. Gently rake the seed bed so the seed comes into contact with the soil mix and gently water in. For green roofs, use a soil mix specifically for the purpose. For wintering the root development should be very good, small seedlings need to be frost free at around 3 to 5°C (37 to 41°F) so if you are growing seedlings through the winter outdoors, outdoor fleece cover will be needed to keep them frost free. Sowing directly into small pots is recommended. Use seed spoons if you have them or mix the fine seeds with fine sand to aid even distribution. Fill pots with an acid-free, free-draining soil seed compost. Tap the pot to settle the compost, but do not firm the mixture down. Stand the pots in water, moisten thoroughly and drain. Seeds should be scattered very lightly over the surface. Sedums require light for germination. Cover seed lightly with vermiculite after sowing. If possible, place in a propagator otherwise, secure a polythene bag around the pot or cover the container with glass or and place in a warm place. Many people make use of a warm place such as the airing cupboard, or near the kitchen boiler. Care should be taken to prevent the pots drying out from below. Keep soil slightly moist but not wet. Some people stand the containers on a tray of damp sand, so that they do not dry out. The seeds germinate best at temperatures of 18 to 22°C (65 to 72°F). Most seedlings appear within 14 to 21 days. Be careful to keep the top of the compost damp but not wet. As soon as the first seeds have germinated, remove the plastic or raise the lid slightly to permit circulation of air. Six to eight weeks after sowing transplant or thin out to 1 to 3 plants into a 9 to 10 cm pot or about 3 to 5 plants into an 11 to 15 cm pot. Avoid very large pots, because the substrate in pots that are too large will be permanently wet and wetness can cause growth inhibition and a poor root development. Sedum tolerates high temperature and dryness, but the roots are very sensitive to wet substrates. Plant in acid-free free-draining soil in a sheltered, sunny position. Low to moderate fertilization levels are required. Use a complete balanced fertiliser, avoid high ammonium and high nitrogen levels. (Very high nitrogen levels in substrate cause shoot stretching and the shoots fall apart). Don't fertilise after mid September. Beds and borders, City, Containers, Cottage/Informal, Drought Tolerant, Gravel, Ground Cover, Low Maintenance, Rock Gardens, Green Roofs. Sedums look good in containers and in combination with other succulents such as sempervivum, echeveria or stonecrop. 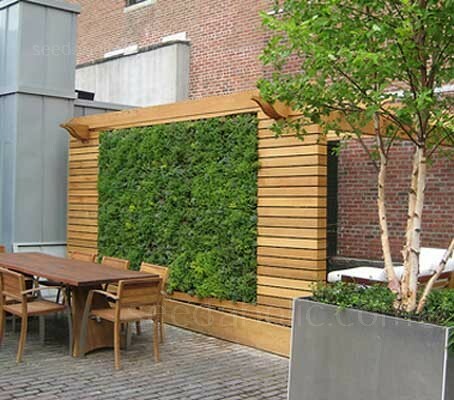 You can also display them with other low growing plants such as mosses, ajuga, or creeping thyme..
Green roofs generally use sedum and other alpines to provide a natural finish to a roof. 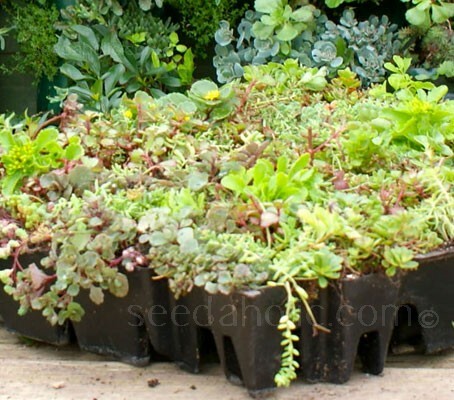 Sedums are at home in poor soil and have drought-tolerant capabilities that are second to none. The plants are very hardy, and can withstand great ranges of temperature and weather. Sedums are able to close off their pores in the presence of hot, bright sunlight, and at night, open up to put out oxygen and breathe in carbon dioxide. The plants have roots that are between 7 to 10cm (3 to 5in) deep. They do not need mowing, weeding or deadheading. During the spring and summer they will flower and attract many insects especially bees and butterflies. 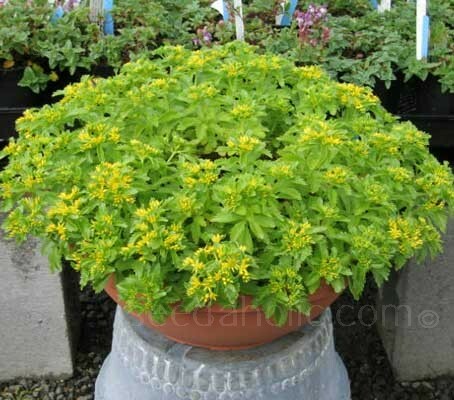 Sedum selskianum is a hardy, handsome, and well-behaved perennial from the Amur River region of Northeast Asia. It is distinguished from the closely related Sedum kamtschaticum by its more compact growth and its narrower foliage. The genus name Sedum is derived from the Latin word sedo meaning 'to sit'. This refers to the manner in which some species of this genus attach themselves to rocks and walls and stony ledges. The species name 'Rubens' simply means 'red' referring to the red tips of the leaves. Several sedums are associated with love, marriage and fertility. The association with love and marriage is shared with sempervivum believed to enhance the fertility of women & the sexual potency of men, so that many love-spells involved the use of stonecrops or hens & chicks. This isn't actually likely; as some sedums have phytoestrogens that could lower male infertility, but it's not inconceivable it also retarded male aggression & so indeed made couples more compatible in mood. There was an associated belief that if evergreen succulents died either in the heat of summer or wetness and cold of winter, this meant the health of a household, or the success of a marriage, was at risk; if it kept its evergreen presence year-round, the household would experience continuous compatibility and good luck.